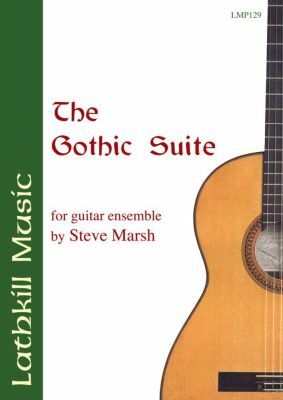 Here at last is the complete five-movement Gothic Suite, originally written for solo guitar and now brilliantly arranged for guitar orchestra (7 different parts). Each movement has a brief narrative at the start and throughout, the music contains special 'ghostly' effects some of them provided from the players themselves. Great fun and highly entertaining. The work was premièred by the Swindon Young Musicians Orchestra in Devizes, Wiltshire in February 2009. Watch/listen to a live performance of the first movement - DIABOLO given by the Noord Nederlands GItaar Ensemble.